We’re into the final straight now, ladies and gentlemen. Certain runners and riders have edged ahead and some have fallen well behind, but we’re well placed to finish in a position we can be proud of. Could we be the Steven Bradbury of the Premier League? No, course not. Stop that you. But as I articulated in further detail in “And Then There Were Five”, there are just five hurdles left. This has turned into a big Scouse bowl of metaphors, so here’s the bottom line; try not to get confused by league tables, form guides and the five-fold of victories needed for a top 4 finish. There are five individual matches, and each one can be won. That starts right here, with the first of two Goodison games in a row. With this one, it’s the tale of two managers who will probably miss out on Manager of the Year for not being Brendan Rodgers, the darling of Sky TV. Roberto Martinez, whatever happens in the final five fixtures, has delivered the highest points return for Everton since we were challenging for league titles. Additionally, he has carried himself with class and dignity, as shown once again in this moving speech at Anfield. He’s our ‘Berto, and he’s going somewhere – but with Everton. Arsene Wenger won’t leave Arsenal until he’s at least 75% dust. The winner of the Hipster’s Choice Award this year is the perennially uncool Tony Pulis. Honestly, he’s that close to turning his cap round and going “Look at me kids, I’m really funky.” You’re not wrong Tone. Anyway, his season pans out as a really abysmal Hollywood B-Movie, with Pulis playing a feisty sergeant who rollocks a bunch of misfits into a fighting fit unit. Throw in that ominous chuckle he let out on Match of the Day, add a cheeky wink to the camera, and we’ve got minimal profit right here. In all fairness, Pulis should take plaudits for not only raising the Titanic but giving it a good polish too. Crystal Palace have always fancied themselves as a solid outfit, and this one is using wing players to play a decent brand of togger too. Julian Speroni is part of the odd trend promoted sides now have of boss goalkeepers, while there are some decent players knocking about. Mile Jedinak takes no prisoners, Joe Ledley looked really really boss against St Mirren and Ross County, so he’s got to be a world-beater, and Jason Puncheon is on a rich run of classic Everton build-up form. In that B-Movie we talked about Cameron Jerome’s without doubt the comedy relief. When Palace fans see him loping about it must really put the “dread” back into “dreadlocks”. Yet for this game they’ve done too well. Safety isn’t assured with five games left but it’s highly unlikely that they’ll be in a relegation scrap come May, even with games against us, Man City and Liverpool to play. As a result they’re concentrating on maintaining an excellent home record while not bothering on the road (won 2, lost 11). Scoring just nine on the road – three of those coming against Cardiff – shows they’re more nervous travellers than Dennis Bergkamp. Not great form for them against a side looking for a tenth home win in a row then. Let’s look at the side then. 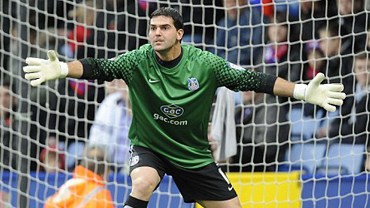 Julian Speroni, he who looks like he’s returned from a gap year with a new do, a fancy girlfriend and “a new zeal for life” – ah, koff you – will be frustrating us all in goal. Mariappa, Dann, Delaney and Ward look a bit Championship but they’re alright. Jedinak looks like he’ll sort Leon Osman’s good eye out for him, alongside Ledley. Puncheon and Bolasie have that FIFA FIVE STAR TEKKERS AND BARE PACE this new football generation love, while there should be a couple of comedy options about. Jerome? Chamakh? Ince? Yeah, that one. Goal for you lad. Lining up for the Blues…er, good question. Howard, Coleman, Stones, Distin and Baines form the sort of defence that makes you forget about that England international for a couple of seconds. Come home, Jags. 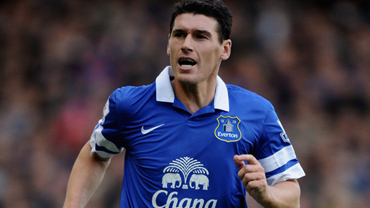 But it’s still a bit flimsy – who replaces Baines if he does his toenail in again? Garbutt? Barry? Barry and McCarthy will only be broken up for the City game after the former went three games without a booking and stunned the FA into introducing amnesty, while Barkley might not start for this one. Osman can have a wander about Goodison now and Ross can have a crack at Fellaini and co on Sunday. Beautiful. Who with then? Mirallas? Deulofeu? McGeady hasn’t had a start in a while, which must mean he’s been on the jam tarts too much or something. Steven Naismith is always worthy of a place, although Sunderland represented some dodgy finishing. Come on Naisy, that’s SO last season. Romelu Lukaku does that boss thing for about an hour and takes the rest off. It’s very simple. A win here takes us nine points ahead of Spurs with four games left, while victory here and on Sunday would confirm European football. We’re looking beyond Man Utd and Tottenham and you know it. Five wins means the top 4. Four wins and a draw does it unless Arsenal start spanking everyone in sight, which we’re a decade late for. So let’s kick it off Everton. That Spanish fella in the dugout is the smooth Pied Piper leading us all to the Promised Land, and I for one am enjoying following his tune. Allez Allez Allez Ohh….